stickboybike: Out with the old, in with the new. 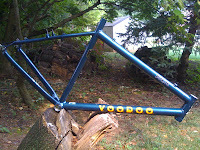 With the arrival of the new 29r last week, I posted my 1999 Voodoo Bokor on the evil eBay. She sold and is going to a new home in Texas, thanks James, take good care of her! This bike had it's maiden voyage in the summer of 1999 at the 24hrs of Snowshoe. The bike was spec'd with full XT, Marzocchi MXR fork, Mavic 517 hoops, Avid Single Digit Ti brakes and for a 21in build, tipped in at 25lbs. Not too shabby for back in the day. The bike steered like a crit bike, climbed like a goat and descended as fast as you cahones' would allow you. The geometry was strictly of Joe Murray who also worked with Kona Bicycles in his day and was a part of the skunkworks crew for Shimano. This BB is about an inch higher than comparable frames that Joe did with Kona like the Kula Supremes. 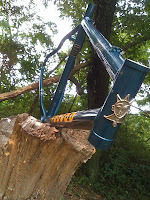 The extra inch was useful for East Coast rock clearance and log hopping. I'll miss her but only a tad less now that the SOK is in the garage.